Taking great model railroad photos is another one of the many arts involved in model railroading. After you’ve spent so much time and energy building your railroad, you’ll want to spend a little time and effort on getting some really good layout pictures. This is part of the fun of building the layout – so you can show it off to your friends, family, and other model railroaders. You can use a 35mm film camera if you like and the model railroad photos you take will be great if you follow the steps outlined below. However, buying and developing film is expensive. And you don’t have much control over the final result unless you have your own dark room. I would strongly recommend a high quality name-brand digital camera, like a digital SLR, with the ability to take photos containing at least 6 or more megapixels, as the best way to go. You spend a little more up front, but the amount you save later in film expenses is huge. And you have much more control over the final result, particularly with the photo enhancing software that is available these days. Many of the point-and-shoot cameras are very good also. A lot of the model railroad photos on this site were taken with a Canon Power Shot A630. Its main advantage for me is that it has a swivel viewfinder. This makes it easier for me to see and compose the scene in the viewfinder while taking the picture. Its main disadvantage, as with most point and shoot cameras, is that the aperture only closes down to f8. This is definitely a handicap when you’re taking layout photos where you usually want a large depth of field. This requires a camera that has the ability to narrow the aperture down to f22, which gives you a much larger depth of field (more of the scene will be in focus). A digital SLR like a Canon Rebel or Nikon D80 will be able to do this. 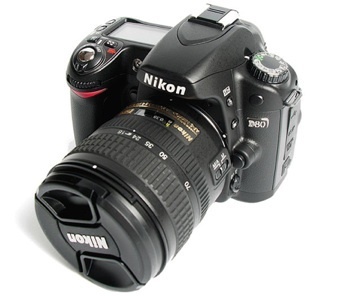 Many other digital SLRs would fit the bill also. I don’t own one, but I think one of the newer D-SLRs might be especially well suited to model railroad photo applications since it has a live viewing screen. This means that you can view the scene before taking the picture on the full 2.7” LCD screen on the back of the camera without having to look in the eyepiece. Many of the older D-SLRs don’t have this feature. This would come in handy if you’re trying to get pictures at eye level near the layout surface where it would be difficult to get your head down low enough to look in the eyepiece. You're welcome to visit the Track Stop Photography page for a listing and more information about digital SLR's, point-and- shoot cameras, tripods, and small photo backdrops and tents that may be of use in model railroad photography. The only way to get really sharp, clear pictures is with a tripod. The heavier tripods are better since they are less likely to vibrate or shake at the second the picture is being taken. You could use a small table tripod and sit it on your layout surface, or use a regular floor type tripod and set it up on the floor. You will get a better depth of field if you are at least a few feet away from your subject. Using the on-camera flash really washes out a model railroad photo scene, and ruins the realism. If your camera will allow you to use a wireless flash off camera, and set up the flash above and to the side of the subject, this is better. Even better than that is to use a florescent or incandescent light source in the same position. That way you can see in the viewfinder what the picture will look like after it’s been taken. Make sure the white balance of the camera is set to whatever type of light source you’re using. You must use a tripod in this situation so your camera can use a slower shutter speed without risk of vibrating. If you use a single light source, it appears the sun is shining on your scene, with all the shadows going in one direction. Multiple light sources create multiple shadows, which doesn’t look realistic. Try to avoid getting any shadows on the backdrop if at all possible. Avoid creating deep, dark shadows in your model railroad photos, which tends to eliminate details of your scenery or structures. You can do this by setting up homemade reflectors on your layout for the photo shoot. Use one or two 8x10” pieces of white cardboard set up in positions to the side of your subject such that light from your light source reflects into the shadows. You can also use a piece of cardboard covered by a sheet of wrinkled aluminum foil. Experiment with the positioning of these reflectors to achieve the best effect. Even if your camera is set up on a tripod, if you take the picture by pushing down on the shutter button with your finger, the camera will move slightly and may result in a blurred result. Sometimes, you won’t notice the blur until you see the result on your computer screen. To avoid this, use the camera’s self-timer feature. Almost all of them have this and it’s easy to use. Even better is to use a wireless remote, which is not available on all cameras, but is a great feature to have when shooting model railroad photos. When taking pictures of any diorama or model railroad scene, you will usually want the majority of the scene to be in focus, that is, you will want a large depth of field. As mentioned above, this can be achieved by using a high “f” setting on your camera, which narrows the aperture. Also, using a wider setting (i.e., less zoom) on your camera or lens will result in greater depth of field. If you have the luxury of being able to set your camera and tripod up several feet away from the scene, this will allow a greater depth of field, as well. Make sure you use a very high quality setting on your camera so that you can crop your pictures in the computer and not lose much detail. When taking model railroad photos, use optical zoom only, never digital zoom. A software program called Helican Focus (http://www.heliconsoft.com/heliconfocus.html) is helpful in blending together bracketed pictures of a scene to create one picture with a much better depth of field than any of the individual pictures. Proper photo composition will often mean the difference between a good picture and a great picture. I like to keep most of my model railroad photos fairly well balanced, but that doesn’t mean the subject has to be directly in the center of the picture. Use the photographer’s “rule of thirds” to create good composition with your subject located on an imaginary line dividing the picture horizontally and/or vertically into thirds. Try to take most of your layout pictures from eye level, as if you are actually standing in the scene taking the picture. This is much more realistic than the bird’s-eye view. Sometimes, it’s helpful to use tracks or roads in the lower part of your composition to help lead the viewer’s eye into the main subject matter. You can “frame” your composition so that it seems that your subject is framed in by other elements of the scene, like trees or structures. If you’re taking “landscape” pictures of your layout, include some bushes or tracks or something in the foreground to add perspective. 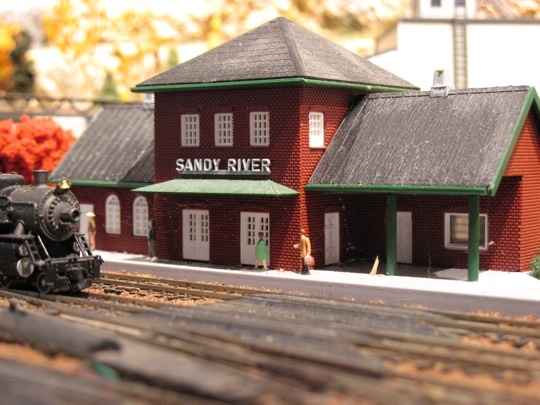 Use “forced perspective” in your scenery and in your model railroad photo composition to make the depth of the scene look much larger than it really is - e.g., add smaller scale buildings or trees in the back of the scene, so that they look farther away. If the sky is in your scene, try not to have the horizon running through the middle of your picture. It should be either above or below the middle - somewhere in the area of the imaginary line separating the picture into thirds. Also, ideally, you should have your trains, people or cars heading or moving into the central part of the picture and not away from the center into the side of the picture. After you have practiced some of these techniques, you may wish to submit one or more of your photos for us to view. We always love to see pictures from other model railroaders! Just go back to the Gallery page, fill out the form near the bottom of the page, and get the link to enter your photo. From "How to Take Great Model Railroad Photos" to "Gallery"
From "How to Take Great Model Railroad Photos" to "Homepage"